We all love the tantalising notion of getting ‘off the beaten track’, exploring places that make you feel that you are only ones around, that you’ve stripped off the scales of life’s trials and tribulations and emerged revitalized and invigorated – able to see for miles and miles, literally and figuratively. But then reality sets in. Off the beaten track sometimes means just that: no ‘track ‘ means it takes ages to get to your chosen hideaway. And sometimes we just don’t have the time. If the journey to a lodge seriously starts to eat into your precious holiday, then you start to question the choice. So with this in mind, here are some ‘off the beaten track’ places within 3-4 hours driving of Cape Town. Some are considerably closer! The De Hoop Collection, with its richly varied fynbos floral kingdom, lies in the little-known and untouched De Hoop Nature Reserve on the Southern coast east of cape Agulhas, the southernmost point of Africa. 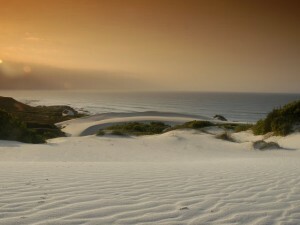 Here the main highway has headed inland leaving this stunning coastal reserve to its indigenous wildlife of bontebok, zebra, eland, red hartebeest and ostrich. 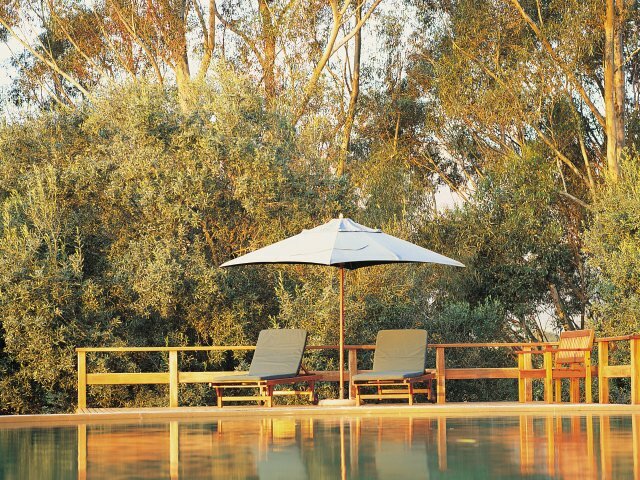 Even within this already remote setting you have a choice of small cottages , manor house rooms, or the aptly named ‘Koppie Alleen’ house (meaning lonely hill) standing in serene isolation in a separate part of the reserve. The many activities include endless miles of trails for hiking, mountain biking, horse riding or simply enjoying the utterly empty sandy beaches. 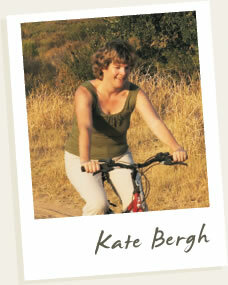 This one is close to our hearts and to our home in the Cederberg Mountains. It is only about 260 km from Cape Town on a good tarred road, but the two mountain passes in between means that it feels like a different world! You leave the Mediterranean climate of the Cape and enter a rugged African wilderness with endless views of the folded mountains that stretch into the distance. Here, in this unexpected setting, you find a five star retreat with supremely comfortable rooms and suites, excellent cuisine and an inviting spa. 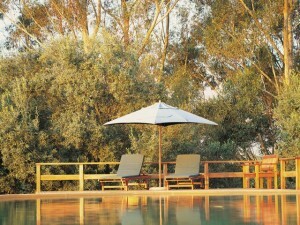 But it is the staggeringly beautiful surrounds which draw you there with glorious tranquillity guaranteed. Mountain biking, walking trails, guided rock art walks and sunset nature drives all ensure that humdrum everyday life is left firmly at home. A South African natural heritage site, Bushmans Kloof Reserve also offers Africa’s largest open air art gallery with more than 130 pristine San (Bushmen) rock art sites. Tintswalo Atlantic still lies (just) within the city limits of Cape Town but if you weren’t staying here, you wouldn’t even know it existed. It lies hidden away in the Cape of Good Hope Nature Reserve just below the famous Chapman’s Peak Drive. You cannot even get there in a normal car and need to be collected from their gates. 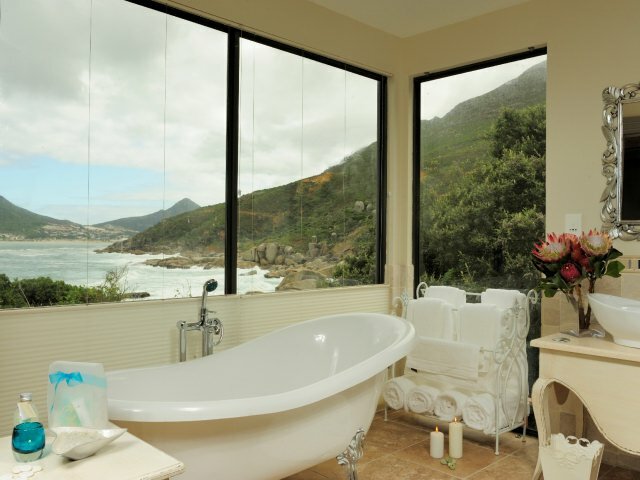 This exquisite, luxurious beach lodge is tucked away right on the edge of the Atlantic Ocean giving glorious views across Hout Bay. Indeed once you are ensconced in your beachside suite, you would hardly know you were so close to the city. Only the twinkly lights across the bay at night time would give you any clue. Another option which won’t wear out the rubber of your tyres is Bartholomeus Klip which lies between the Cape Winelands and the picturesque village of Tulbagh. This beautifully restored Victorian country homestead is set in its own private nature reserve with walking, nature drives, canoeing and mountain biking on offer. Or you can just park out by its tranquil farm dam with a ripping read in hand. 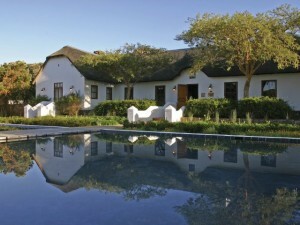 Bartholomeus Klip is a winning smorgasbord of excellent cuisine, charming accommodation and utter tranquillity. There are other game lodges which are closer to Cape Town but this one is the real McCoy. Because of its location off the road less travelled, the scenic R62, as well as the sheer size of Sanbona Game Reserve, you really do feel like you are away from all civilization. Sanbona offers 54,000 ha of undulating mountains and plains, indigenous wild flowers and San (Bushman) rock art as well as surprisingly good game-viewing. 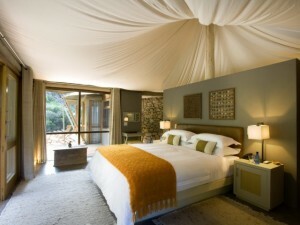 This includes all of the ‘Big Five’ and is certainly the best wildlife reserve in the Western Cape. There’s a choice of three lodges but for a true sense of wilderness, we recommend Dwyka Tented Camp , a luxurious tented camp set in a remote rocky kloof. Abalone House is not ‘off the beaten track’ in itself, but the picturesque fishing village of Paternoster certainly is. This is the place to utterly relax either at the beginning, or the end, of a Cape holiday. There’s not a myriad things ‘to do’ so you will feel no guilt for not doing them. 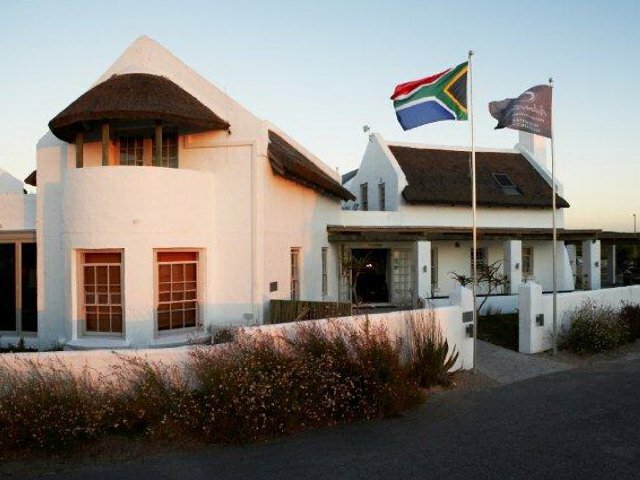 A lonely walk along the 7 km of sandy beach, a visit to Columbine nature reserve for its glorious spring flowers and fynbos, a bracing swim in the waves of the Atlantic ocean or a quiet seafood lunch at a local restaurant – that’s about all that’s on offer here. What a hardship! Abalone House is a small luxury retreat with just ten rooms, an exuberantly furnished main lodge and a great little restaurant. 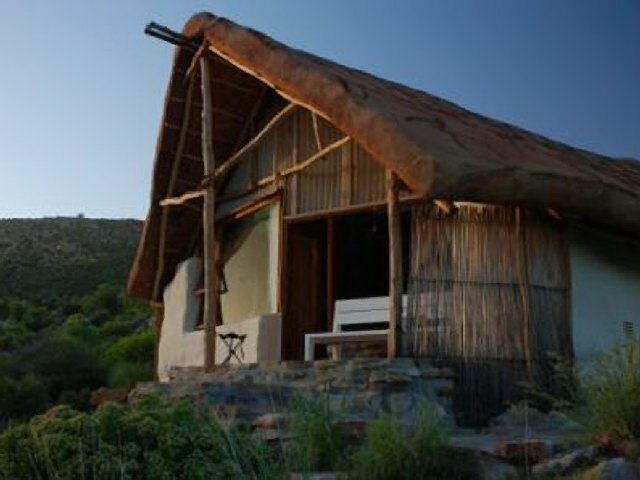 Yes I know – another lodge in the Cederberg mountains. What can I say; I am biased and proud of it! Oudrif Farm is a real gem. The greatest attraction of Oudrif has to be its complete isolation within a hidden kloof (valley) offering complete relaxation for weary city slickers and adventurers alike. Even their directions give you a sense of this as you are instructed to ‘turn right at the large painted rock and then left at an old wheel’…However Oudrif has lots to entice guests: natural rock pools for swimming year round, spring flowers, the odd spot of fishing, rock art sites amongst indigenous fynbos, walking, star-gazing and delicious meals rustled up by your host Bill in his seemingly effortless manner. « 2nd time we’ve encounted Cape Mountain Leopard in the Cederberg!